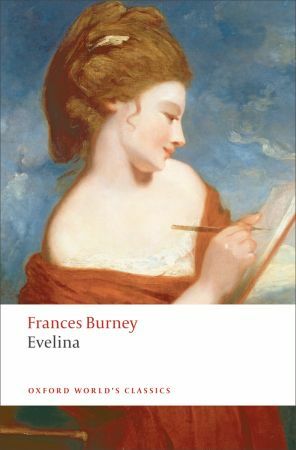 I loved Evelina by Fanny Burney. It’s a silly, funny romp of a novel and I could not have been more delighted by its epistolary format. I love fictional correspondence just as much as real-life exchanges and no correspondent, real or fictional, could be so reliably entertaining as young Evelina, writing to her guardian to tell of her adventures in fashionable London and her astonishment as she encounters absurd society folk, embarrassing family members, and first love. We came home from the ridotto so late, or rather, so early, that it was not possible for me to write. Indeed, we did not go, you will be frightened to hear it, – till past eleven o’clock: but nobody does. A terrible reverse of the order of nature! Though Evelina begins her adventures in the safe, comfortable company of her friends the Mirvans, she eventually moves on to spend time with the upstart grandmother she has only just met, Madame Duval, and her vile cousins, the Braughtons. Poor Evelina, what a disturbing change for a girl used to educated, refined companions! The arrival of the loud, jesting Captain Mirvan had been upsetting enough for her but the switch to the company of her unknown family is even worse. Evelina is deeply embarrassed by her relations but is helpless to distance herself from them. They are loud and boorish, unrefined and inconsiderate, and view Evelina’s reserve and astonishment at their behaviour as snobbishness. I found this second volume almost upsetting to read. Rather than enjoy the hearty comedy this section has to offer (and it is the most blatantly comedic volume), I could only feel the poor heroine’s distress at her situation. I am a very empathetic reader and if there is embarrassment to be felt, as there surely was here at the rude behaviour of Evelina’s relatives and the innocent blunders of Evelina herself, I will flush just as red as the heroine and tremble to turn the page lest things get worse. As befits the heroine of a light, fantastical romance, Evelina is not just good and young but also extremely pretty. So much so that every young (or simply unattached) man she comes across must fall in love with her. Lord Orville, he who is without peer in terms of virtue, meets Evelina at her first London social event, which is just the sort of thing that happens in novels (hello Mr Tilney) and must have raised giddy expectations among legions of young, female readers. But Lord Orville, though the first and most worthy of Evelina’s admirers, is by no means the last. Those who follow are varying degrees of awful and unsuitable but are all significantly more amusing than Lord Orville (romantic heroes are sadly too dignified to ever be truly entertaining). But as much as I love Evelina, I did feel rather bad for Maria Mirvan, the dearest friend Evelina has in the world and her companion on her first trip to London, who seems to gain the attentions of no gentlemen at all. Poor Maria, to be witness to the endless adoration of Evelina without provoking any similar attentions for herself. The conversation of Lord Orville is really delightful. His manners are so elegant, so gentle, so unassuming, that they at once engage esteem, and diffuse complacence. Far from being indolently satisfied with his own accomplishments, as I have already observed many men here are, tho’ without any pretensions to his merit, he is most assiduously attentive to please and to serve all who are in his company; and, though his success is invariable, he never manifest the smallest degree of consciousness. It was only in the third volume, when Evelina and Orville find themselves brought together during a visit to Bristol, that some of his frustrations and insecurities are revealed in his now much more determined courtship of Evelina. And the poor man really is cruelly tested, between Evelina’s secretive relationship with the young Mr Macartney, Sir Clement Willoughby’s continuing impositions, Lord Merton’s crude overtures on the eve of his wedding to Orville’s sister, and Evelina’s own abrupt coolness towards Orville (on the advice of Mr Villars). But, despite these obstacles, he pursues our heroine and, quite easily, wins her (as it was clear he was going to do from the moment he was introduced). I wish more of the lover-like dialogue between the two had been included rather than simply alluded to but, given that it was all related in letters to Mr Villars, her father-like guardian, I can at least rationalise its exclusion. The truly absurd family drama relating to Evelina’s father I’ll let you discover on your own. To say it is complicated would be to vastly over-simplify the situation and it is truly the silliest part of the novel – I can’t help but laugh when I think about it. When father and daughter finally meet, they have simultaneous hysterical outbreaks. That scene may in fact have been the comedic highlight for me and I couldn’t help but think of how Jane Austen parodied such behaviour in her juvenilia. I grew surprisingly fond of Evelina. She is very innocent and very good and, in her letters to her beloved guardian Mr Villars, very honest, no matter how foolish her adventures make her appear. But she is not silly or even stupidly naive. She has some powers of discernment and a strong moral compass. Most importantly (and often amusingly), she is able to correctly judge the characters of those around her. Evelina values substance over artifice and her introduction to the world, after having spent seventeen years in a quiet country village, gives her the chance to test and develop the good judgement Mr Villars has instilled in her. Indeed, it is when she finally acts on her own judgement (rather than merely reflecting on her instincts while allowing her actions to be guided by others), rejecting the advice of Mr Villars and trusting her judgement in welcoming the advances of the virtuous Lord Orville, that the reader can rejoice. True, she trades the protection and guidance of one perfect man for that of another but she chooses to make that trade, she sees the honesty of her lover’s affections even when Mr Villars is warning her there is none. She has grown into an independent, rational adult – which is more than can be said for most of the characters she encountered along her way. A very satisfying ending to a wonderful entertaining novel. On Christmas Eve, after the festivities of the day had drawn to a close, I curled up in the living room amidst the shreds of papers and bows that had had flown when a few hours earlier gifts were being unwrapped, cracked open Barchester Towers by Anthony Trollope and immediately found myself with Dr Grantly and Mr Harding at the deathbed of Bishop Grantly. I had enjoyed my introduction to Trollope’s Barsetshire with The Warden but it was immediately clear I was going to enjoy this much, much more. The problem of who to appoint as the warden of Hiram’s Hospital continues but that appointment pales in comparison to some of the more august clerical vacancies that come up during the course of this novel, beginning with the greatest position of all in Barsetshire: the bishop. Bishop Grantly times his death poorly, waiting just long enough for the government that would have favoured replacing him with his son to pass out of power. Instead, the unknown Dr. Proudie, whose greatest accomplishment is as the conduit for church reformers and the forceful Mrs. Proudie, is awarded the position. The bishop is masterfully aided in his work by his eloquent chaplain, Mr Slope, who, in combination with Mrs Proudie in particular, hopes to pursue an agenda completely counter to everything Dr Grantly and Mr Harding believe. If he ever thought of freedom, he did so as men think of the millennium, as of a good time which may be coming, but which nobody expects to come in their day. As she spoke she with difficulty restrained her tears; but she did restrain them. Had she given way and sobbed aloud, as in such cases a woman should do, he would have melted at once, implored her pardon, perhaps knelt at her feet and declared his love. Everything would have been explained, and Eleanor would have gone back to Barchester with a contented mind. How easily would she have forgiven and forgotten the archdeacon’s suspicions had she but heard the whole truth from Mr Arabin. But then where would have been my novel? She did not cry, and Mr Arabin did not melt. I already have the next book in the series (Doctor Thorne) out from the library and I am eager to get reading and to return once more to beloved Barsetshire. I feel like I should have more to say about The Warden by Anthony Trollope. When I read The American Senator earlier this year, I was stupidly ecstatic the entire time, delighted by every character, amused by every turn of phrase. I had been warned that The Warden, the first of Trollope’s six Barsetshire novels, was the least impressive of the lot. Well, I didn’t adore it but I did enjoy it. If this entertaining, amusing, affectionate novel is the least impressive of the series, I am very excited to read on. The book is concerned with the trials of one Septimus Harding, a respected, well-liked clergyman in the cathedral town of Barchester, who is also the warden of Hiram’s Hospital, an alms-house for a dozen aged and infirm local men. Mr Bold, an earnest young reformer, is convinced that the hospital funds are being unfairly allocated and that the warden’s income of £800 is overcompensation for the minimal duties he is expected to perform. Poor Mr Harding, who had never questioned his income before, had in fact used his personal funds to increase the allowance given to the hospital’s residents, is placed at the center of the controversy and the book focuses on his struggle to decide his opinion on the matter. His claim to the money is supported by the clerical community, most especially by the forceful archdeacon Dr Grantly, the son of the Bishop and the husband of Mr Harding’s eldest daughter, while John Bold, having brought the issue to public attention, is clearly of the opposing faction, though he counts Mr. Harding as one of his dearest friends and is in love with Harding’s youngest daughter Eleanor. A fine mess, indeed, though from the start there are clearly so many satisfactory outcomes available that there is no real sense of tension. 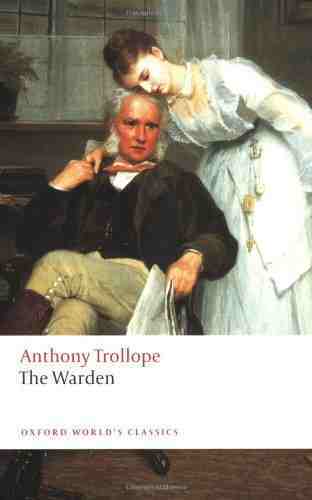 What I particularly loved about The Warden were Trollope’s descriptive passages. Most of these were mere tangents to the main plot, with Trollope poking fun at newspaper men, politicians, clergymen, lovers, spouses…really anyone and everyone who could possibly be woven into the story however remotely, but they had me giggling away throughout the book. It is these passages that allow the observant, witty narrator to establish himself as the most entertaining character of all. 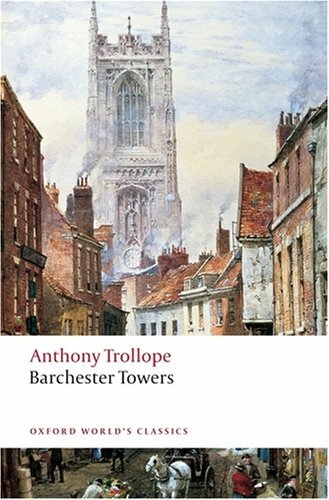 Trollope is particularly excellent when introducing new characters: the introduction of the Grantly sons, and the narrator’s blunt remarks on their virtues and failings, seemed to be unnecessarily lengthy and yet, for me, it was one of the most entertaining parts of the book. Much time is devoted to studying each character, however insignificant, and none is without his or her virtues but they all have some human foibles, as befits the cast of a comedy. He was about to defend the holy of holies from the touch of the profane; to guard the citadel of his church from the most rampant of its enemies; to put on his good armour in the best of fights; and secure, if possible, the comforts of his creed for coming generations of ecclesiastical dignitaries. Such a work required no ordinary vigour; and the archdeacon was, therefore, extraordinarily vigorous. It demanded a buoyant courage, and a heart happy in its toil; and the archdeacon’s heart was happy, and his courage was buoyant. Honestly, the plot of The Warden is not terribly well formed. Even as the scandal is escalating, it was difficult to feel much concern when the narrator clearly didn’t, happily contenting himself with making amusing remarks about all the actors involved and the complications of their home lives. But it is these amusing asides and these excellent, flawed, essentially good characters that make the novel so entertaining and which make me so excited to read on. I already have my copy of Barchester Towers pulled out, ready to commence reading as soon as I begin my Christmas holidays at the end of this week. 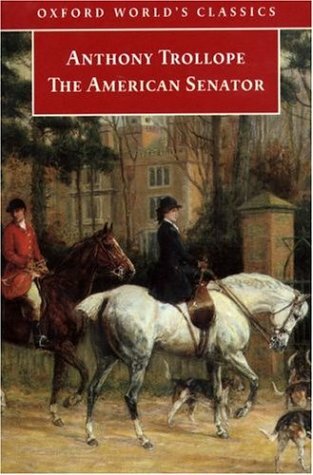 After reading The American Senator by Anthony Trollope, I am now certain that Trollope will become one of my favourite authors. I had suspected as much before but, now that I have finally read him, I know. So chatty, so funny, so detailed, so entertaining – this book was everything that a book should be! The plot of The American Senator has very little to do with that gentleman, a Mr Elias Gotobed, who takes great delight in insulting his hosts in the name of education (for surely they must be made to see how flawed their ways are), and much to do with those who reside in or pass through the country town of Dillsborough one winter. When have I ever been able to resist a novel about English country life? The novel is comprised of three main, interconnected stories: the Senator’s fumblings about society, the romantic life of the unassuming Mary Masters, and the attempts by the dazzling Arabella Trefoil to catch the wealthy Lord Rufford (though she is already engaged to the diplomat, and local squire, John Morton). I have to admit, the novel does begin slowly with several chapters devoted to the histories of Dillsborough’s local families, explaining long-standing feuds and giving character descriptions of the neighbourhood’s eligible males. It’s important information but presented in a very tedious way. However, as soon as the narrator’s explanations are concluded and the characters appear and begin to speak for themselves, the fun begins. John Morton has just returned home from a diplomat posting in America, where he came across and became engaged to Arabella Trefoil, an Englishwoman travelling abroad with her mother, and made the acquaintance of Mr Gotobed. These characters quickly join him in the country; Arabella and her mother with the purpose of surveying Morton’s home and evaluating his worth as a prospective spouse and Mr Gotobed with a view to educating himself about the English people and their customs. At a local hunt, Mr Gotobed has much to critique and Arabella much to consider, as she meets the wealthy, eligible and possibly attainable Lord Rufford. With effort, she is beautiful but she is getting older and there is little money. She accepts Morton when they meet in America but, when she meets Rufford and recognizes him as the greater prize, quickly shifts her focus without ever quite sacrificing the security offered by Morton. And she handles it marvelously, it must be said, though she’s not quite so clever as to actually pull it off. And yet Rufford’s fate, having slipped Arabella’s grasp, is perhaps less pleasant than it would have been had he yielded and married her. There is no love match waiting for him, just a more subtle huntress, favoured by his family, who bides her time until he is exhausted by the hunt and too weak to give flight. Arabella, having lost both Rufford and John Morton, makes a surprisingly suitable match to a young man as clever, hard-working, and calculating as she, an intriguing end to an eventful career. She is certainly not good but then neither does Trollope cast her as entirely bad, musing that “there was something even in her hard callous heart softer than the love of money, and more human than the dream of an advantageous settlement in life.” She is an endlessly intriguing character and certainly the most memorable one in the novel. And then we have the final thread of the story, the romance thrown in to entertain soft-hearted female readers (that would be me). Mary Masters is the daughter of a country lawyer who, after her mother’s death, was essentially raised by Lady Ushant until that lady was forced to remove from the area after her great nephew John Morton inherited Bragton, where she had been living (this is one of those messy family relationships explained at the beginning of the novel). As the novel begins, Mary is in her early twenties and has been living with her father, step-mother, and half sisters for some time. Mary is content with her family but perhaps a little more refined than her sisters. A well-off local farmer – not quite a gentleman, to his dismay – Larry Twentyman is desperately in love with her. Larry is everything that a lover should be. He is earnest, constant, respectful, and passionate. He cannot conceal his love for Mary, nor his disappointment each time she rejects his advances. He is handsome, young, in possession of a good house, a good fortune, and a good temper. He is ideal. Everyone around Mary certainly seems to think so, from her step-mother to Lady Ushant. The townsfolk are in universal agreement that the match would be a good thing. The only ones who disagree are Reginald Morton, a local gentleman now in his late thirties who has been friends with Mary since her childhood, who thinks her too fine, too cultured for the countryman Larry, and Mary herself, who knows even before she realises her love for another, that she cannot return Larry’s affection. Larry is everything that is good-humoured and generous but, after hearing Reginald describe his quiet daily life to Mary, was there ever really a chance I was going to favour Larry? : ‘I rush in and out of the garden, and spend my time between my books and my flowers and my tobacco pipe.’ Alright, not a terribly heroic schedule but clearly that of a man after my own heart. Larry suffers greatly when the true lovers get their happy ending, which I did so appreciate (however cruel that may sound). I hate novels where there is obviously one good lover and one bad one, or where the enthusiastic lover proves comically unfaithful when rejected. Larry is constant and endures – though not quietly – the pain of unrequited love, lending him a certain air of nobility. Besides, his future is not so bleak: there is promise of future happiness with Kate Masters, Mary’s younger half-sister, a friend and hunting partner of Larry’s, who possesses a jolly spirit that matches his own. I purposely started my Trollope reading with a comic, stand alone novel and I am so glad that I did. It was a wonderful way to test the waters, as it were, and I’m thrilled to know I have his series to look forward to as well as his many other independent novels. Isn’t it wonderful to discover a favourite author who was also shockingly prolific? Anne Brontë is easily my favourite Brontë sister but, frankly, she held that position without me knowing anything of her or her writing, her standing based entirely on my dislike of her sisters’ books. I have also always rather liked her pen name, Acton Bell, which is perhaps a silly reason to favour a person but there you have it. My dislike of Jane Eyre is well documented and my opinion of Wuthering Heights is so low that expending the effort to express it would be to give the novel more attention than it deserves. But, other bloggers were quick to cry, Anne Brontë is different! Hate Charlotte, loathe Emily, but give Anne a chance! Who am I to resist the advice of such learned friends? 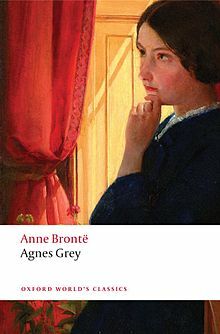 I picked up Agnes Grey by Anne Brontë, read it, and, I am happy to report, rather enjoyed it. The eponymous heroine of Agnes Grey is the youngest daughter of a well-meaning clergymen, beloved by his wife and daughters but rather irresponsible when it comes to managing the family’s wealth. When they fall on hard times, Agnes is determined that she shall not be a strain on her parents’ limited resources so she hires herself out as a governess. And, thank goodness, this is where the story began to both surprise and delight me. It is funny! I had not anticipated that, not realised that Anne Brontë would be able to make me smile and chuckle as she unerringly portrays her overbearing employers and ill-behaved charges. This is not an affectionate portrayal of the life of a governess. It stresses the isolation Agnes feels in the households where she is employed, how powerless she is in dealing with both the children and the adults but, generally, it is by no means a dreary book. If anything, it attempts to cover too many things in too few pages, turning this into a book crammed with wit, romance, a shocking amount of moralizing (usually expressed with some painfully affected writing), and some rather heavy themes (isolation and oppression being the two main ones). It is an interesting but confusing mix. I have mixed feeling about the central romance story. Agnes falls in love with the new curate Mr Weston almost immediately after meeting him. Mr Weston is very, very good (as behoves a clergyman) and very, very boring. It takes only a few glances at him in the pulpit, a few words of praise from a mutual acquaintance, and one face-to-face conversation before she is quite enamoured. This alone amused me. What young woman hasn’t nursed a crush through such adversary, through a total lack of contact or communication, through complete ignorance of his interests, background or, indeed, character? Who hasn’t, like Agnes, built castles in the sky on the strength of one perfunctory conversation? I adored Brontë’s description of Agnes’ rapture on seeing him speak in church. How convenient to be in love with someone who you can so easily gaze on and listen to without looking like a stalker! It is a strange novel in that, though it covers many years of Agnes’ life, she does not develop during that period. She remains exactly the same from start to finish. As a reader, I am usually eager to feel sympathy with the heroine but there is nothing particularly sympathetic about Agnes. Respectable and admirable, yes, but not sympathetic. I want to like Agnes, do in fact love her when she is thinking catty things about her charges and employers, but she turns into a bit of a drip over Mr Weston, mooning over him and daydreaming about him with no encouragement, which I suppose is realistic enough but still tiresome. The ending is disappointingly formulaic and needlessly drawn out. The good, moral characters get good endings while the selfish ones are punished for their sins – instructive, no doubt, but not particularly satisfying or memorable. Still, it is a highly entertaining novel if not necessarily a great work of literature and I’m very happy to have finally found a Brontë whose work I enjoy! 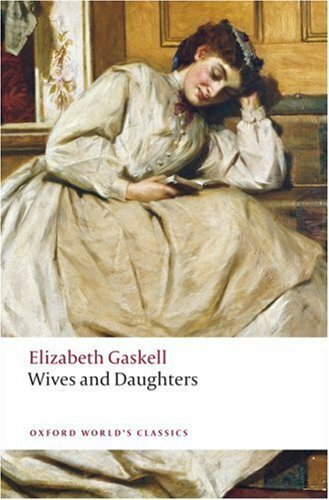 I can’t remember exactly when I first read Wives and Daughters by Elizabeth Gaskell, what urged me to select it in the first place. It was a summer while I was still in high school, I know, and I remember finishing it as I rode the bus home from work, missing my stop as I read those last pages, reeling with both delight and a sense of immense loss as the story transitioned from the last rather anti-climactic sentence Mrs. Gaskell penned before her death to the satisfactory outline of an ending contributed in her absence by her editor. Each time I reread it, I come away feeling the same: after hundreds of pages, with the happy conclusion in sight, the abrupt end is always a shock and there is always disappointment that, even though you know how Gaskell intended to end the story, you’ll never have the pleasure of seeing how she would have executed it, what artistry and skill she would have employed in giving our heroine her much-deserved happiness. Wives and Daughters, for those not already acquainted with Gaskell’s masterpiece, is primarily the story of Molly Gibson, the daughter of a widowed country doctor. I hesitate to call it a coming-of-age story, knowing how some readers recoil in horror from anything so labelled, though it certainly is the chronicle of Molly Gibson’s steady growth and maturation. Instead, I shall call it a novel-ish sort of novel. It has everything you could want: romances of every kind, comedy, tragedy, mystery, and delicious secrets. And yet it is not in the least sensational. There are dramas of every sort going on around Molly but they are of the small, domestic kind. Bad marriages are made and people die of lingering illnesses but these are the worst things that happen in Molly’s world. 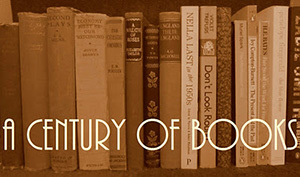 It is a very human story, very relatable regardless of the decade or century. Writing in the 1860s, Gaskell chose to set the story in the 1830s, the time of her girlhood, making Molly her own contemporary, and while the fashions and lifestyles may have changed somewhat over the years, the characters that Gaskell peoples her book with are instantly recognizable. As the novel begins, one of Mr. Gibson’s young pupils has fallen in love with the almost seventeen year old Molly, and, worse, tried to declare his love by secret letter to the oblivious Molly. Mr. Gibson quickly packs his daughter off for a long promised visit to a nearby family, Squire and Mrs. Hamley at Hamley Hall, and sets about rethinking his status as a widower. After all, he reasons, a motherless daughter is a sad thing to have on ones hands. Is it not his duty to his beloved daughter to ensure that she has the proper female guidance as she transitions from child to woman? And so, without Molly’s knowledge, he begins to think of marrying again and begins a modest courtship of Mrs. Kirkpatrick, a schoolteacher and former governess already vaguely acquainted with the family. Eventually, reluctantly, Molly has to return home to her father and her new mother and this is when the novel really begins to take off as Gaskell begins to incorporate more and more characters, some of them truly magnificent creations. Mrs. Kirkpatrick/Mrs. Gibson is marvelous. A pretentious but poor widow, she eagerly accepts Mr. Gibson’s offer and the improvement in her material circumstances and social standing the marriage offers. She instantly sets about ‘improving’ his house, his diet, and his daughter and, intriguingly, putting off the return of her own daughter Cynthia, who is the same age as Molly, from school in France. But Cynthia does eventually return and she is just as wonderful and flawed as her mother. Cynthia may never be good but, like Vanity Fair’s Becky Sharp, she will always be interesting. It comes as no surprise when Roger is instantly smitten by her on their first meeting – who would not be? Things become suitably tangled after that and Gaskell makes the rather inspired decision to send her male love interest off to Africa for much of the novel, meaning no romantic conclusions can come about too quickly – a clever tactic when writing a serialized story! As I said before, yes, this is a coming-of-age story about Molly Gibson but it is so much more. It is a story about families: the Hamleys and the Gibsons and the changing relationships within them: the loyalties between brothers, between sisters, the bonds of fathers and sons, fathers and daughters, and the consequences of both good and bad marriages. Squire Hamley may be my favourite character. He certainly suffers the most, losing his beloved wife and his son, whom he spent most of the time at odds with. He is very emotional too, far more so than any of the other characters, male or female. He speaks about what he feels – loudly! – while everyone else conceals their emotions. It is not necessarily a positive trait: after all, his vocal admonishments of his eldest son only drive them further apart, Osborne taking his father’s words in his usual sensitive manner, leading him to conceal some rather significant details about his life away from Hamley. So many readers eschew Victorian novels because of their repressed characters, mostly male. Squire Hamley must be the antidote to such stoics yet he manages to be emotional and sympathetic without being emasculated. He has an overwhelming personality and can be selfish in his desires and expectations; while I may not want him as a father, I will always love him as one of the most vivid and lifelike characters I have ever come across. Molly is good. That is a very unfashionable thing to be, especially these days, but I do prefer my heroes and heroines to be so. She is not angelically good like the heroines of sickeningly sweet children’s story or cheap, mostly forgotten Victorian novels. She struggles, she talks back on occasion, gets frustrated and angry like anyone but, more often than not, she does as she believes she ought, even, most importantly, when it may bring social ruin. And there’s something very noble and wonderful about that, about her desire to be good and helpful to others. Roger is equally good and I love him for that. After all, that is how Roger and Molly first became friends, when he sought to comfort and help her through a difficult time. Finally, I love that they are both the kind of people who worry (to both the amusement and approval of their elders) about being worthy of the one they love – so different from the callous, delightful Cynthia, casting lovers aside with reckless abandon until she finds the one who seems to expect the least from her and worships her all the same. I have so much more I could say about Wives and Daughters, so many minor characters that could be discussed, so many plot points that could be analysed! It is a novel that I never tire of talking about, full of characters that will be with me always. If you haven’t already read it, please do. Take your time and enjoy it. Or, if you’re not ready to make the commitment to six hundred odd pages of superb entertainment, do at least check out the BBC adaptation penned by Andrew Davies with Justine Waddell as Molly, Keeley Hawes as Cynthia and Michael Gambon as a truly spectacular Squire Hamley.